Illinois is one of the East North Central states of the US. 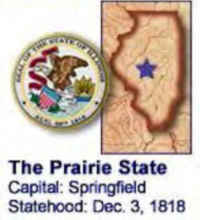 Illinois is the fifth most populous and twenty-fifth largest state in the entire United States. The state is a major transportation hub, boasting major US cities like Chicago and Springfield. It is bordered by Wisconsin to the north, Iowa and Missouri to the west, Kentucky to the south and Indiana to the east, and the Wabash and Ohio Rivers on the southeast and south. Illinois's name is Algonquin for "tribe of superior men"
The landscape of the country can be divided into three major regions : the Central Plains, The Shawnee Hills and the Gulf Coastal Plain. Illinois was transformed into a leading manufacturing region in the late 19th century but continued as a major producer of farm commodities. Chicago, a great metropolis on Lake Michigan, is Illinois's principal economic and cultural center. Today, Illinois stands high in manufacturing, coal mining, agriculture, and oil production. The state's manufactures include food and agricultural products, transportation equipment, chemicals, industrial machinery, and computer equipment. The sprawling Chicago district (including a slice of Indiana) is a great iron and steel producer, meat packer, grain exchange, and railroad center. Chicago is also famous as a Great Lakes port. Illinois is a leading producer of soybeans, corn, and hogs. Other agricultural commodities include cattle, wheat, oats, sorghum, and hay. Illinois has four distinct seasons, ranging from cold winters to hot, somewhat humid summers. By far the best time to visit is May-October, when temperatures are mild and fairly predictable. In winter, temperatures may vary as much as 20 degrees F/11 C in an hour, and the wind can make very cold temperatures even colder - and more dangerous (dress very warmly if you're visiting then). Northern Illinois averages 25 F/-4 C in January, 75 F/24 C in July. 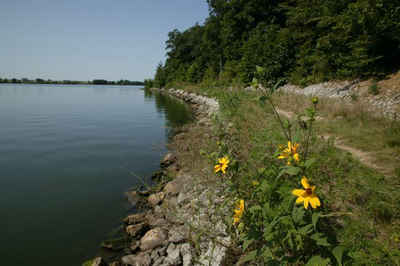 Southern Illinois averages 36 F/2 C in January and 79 F/26 C in July. Central Illinois gets more than its share of ice storms during the winter and tornadoes during spring and summer. The Chicago area within 3 mi/5 km of Lake Michigan tends to get much more snow than the rest of the city because of the "lake effect." Illinois offers a diverse array of attractions including statewide historical points-of-interest, professional sports (baseball, basketball, football and soccer), non-stop shopping venues, summer and winter outdoor activities, a growing wine country and world class museums. Some of the most visited sites in Illinois include Wrigley Field, Shedd Aquarium, Adler Planetarium, Starved Rock State Park, Black Hawk historic site, the home of Mormon leader Joseph Smith in Nauvoo, the homes of Ulysses S. Grant, Ronald Reagan and Abraham Lincoln, and Chicago's Field Museum, Magnificent Mile and Sears Tower. 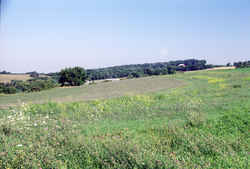 Charles Mound, hill, an ancient burial mound 1,241 ft. (378 m) high, NW Illinois, near the Wisconsin line. In a land of plains, Charles Mound stands as the tallest natural feature in Illinois at 1,235 feet above sea level. Total Area 57,914.38 sq. mi. Land Area 55,583.58 sq. mi. Water Area 2,330.79 sq. mi.